Yellow Rose of Texas is a cute, modern country style, four bedroom three bathroom home that sits in the heart of Red River, New Mexico. This three story home is perfect for giving much needed space to large parties. We love our pets and we know that you do too which is why the Yellow Rose is pet friendly! Please contact our office staff with any questions or pricing. This home is one of the few pet friendly units that has a fenced in patio to the right of the house. On the main level when you walk through the door is where you will find the first three bedrooms and the first full bathroom. The first two bedrooms are both equipped with a queen bed in each room, a TV, and access to the hallway bathroom. The third bedroom on this floor has a set of double bunk beds, a TV, and access to the hallway bathroom. Going up to the middle level you will find the kitchen well stocked with all the necessary items needed for prepping and cooking any meal, any time. Also on this level is another full bathroom, the dining area furnished with a large family sized table that had room enough for the entire family to sit and dine together; you will also find the homey, well-furnished living room which has a large flat screen TV with a DVD player giving you the option of watching cable or movies brought from home. Another great addition to this family room is the wood burning fireplace where families and friends can sit around the crackling flames and tell stories or go out onto the balcony and take in the clean mountain air. Continuing up the last flight of stairs you will find the master bedroom. This room is equipped with a queen bed, a TV, and access to your very own private bathroom. The large windows on both sides of the room lets in great light and the view is amazing! Other amenities that the Yellow Rose of Texas guests may use are the Charcoal BBQ Grill, free Wi-Fi, ATV/Snowmobile trailer and multiple vehicle parking, fenced in courtyard and just around the corner from shops, restaurants and the Red River Ski and Summer Area. Three story home only a block from Main Street with several steps to main level. Fenced in patio area great for pets who love being outside. Three queen beds, two double beds, one twin sleeper. Living room includes flat screen TV, DVD player, wood burning fireplace, and access to a balcony. Yellow Rose provides cable, free WiFi, washer/dryer, and a charcoal BBQ grill. Yellow Rose pet policy: Pet Friendly! Julie was very responsive on text. I was in need of an additional crock pot and was accommodated. West Virginia team member was very nice too. Convenient and clean. Other than new dishwasher and improved WIFI, wed certainly consider this location again. 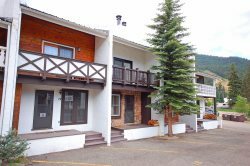 Great location and views of the mountain! We always love Red River we have been coming to Red river as a family for 41 years and sometimes twice a year. A great place for relaxing. Staff was extremely efficient, friendly and knowledgable! We absolutely loved our stay at the Yellow Rose of Texas property in Red River. Thank you so much and we look forward to our next visit! I could not of been happier with our experience! We will definitely be returning!